As with any old classic cars, there are routine precautions to take before purchasing. Either deterioration through age or poor quality restoration and repairs can lead to a frustrating ownership if you don't know what to expect. 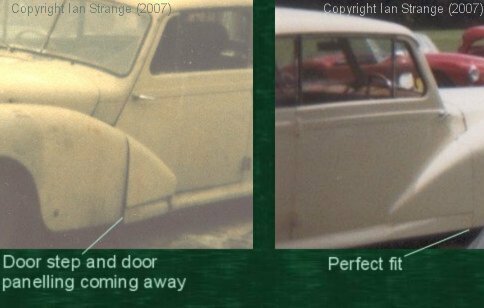 The first concern with the AC 2 Litre is the wooden body frame, since this requires specialist attention if you get it professionally restored, or a lot of time invested if you do it yourself. The AC engine is excellent if it has been maintained carefully and any rebuilds done to a high standard. If the engine has been bodged or neglected, then it can become a head-ache for any new owner. The outer panelling is of aluminium alloy, apart from the brass radiator cowl. Most of the brightwork is brass. The first thing to look at is the wood frame. Not that you can normally see much of it, but there are external tell-tale signs to look out for. Firstly, look at the bottom front corner of the doors, the front end of the door steps, and how they align with the front wings. If the wood has rotted, the panelling may stick out where it has come loose. The door step may be sagging. The rear bottom corner of the front wings may be loose if you pull them outwards. With the doors open, you can see a small detachable panel at the back of each front wing. If these are removed, you can see the condition of the plywood panels that support part of each wing. These are one of the first wooden parts to rot away, so if you are looking for a car to restore, don't be alarmed, since the rest of the frame should not look as bad! Feeling how well the doors close is another useful test. The doors may sag and scrape the door-steps. If this is due to loose or worn hinges, then it not a serious matter. If it is due to a distorted body (resulting from a restoration or major repair), then it may be very difficult to put right. The door itself might be sagging a little if it is in poor condition, although there is a steel diagonal strap inside to minimise this type of sag. Check under the carpets to see if any rot found in the door-steps has spread, especially near the vertical posts that reinforce the screen pillars. The screen pillars themselves tend to rot just about level with the tops of the wings. The floor panels under the front seat and for the front foot-wells, are plywood and need to be checked. Underneath the door-steps, the woodwork is exposed and the smaller components rot easily unless they have been protected/preserved well. Next on the check-list is the plywood part of the bulkhead. If the bonnet seal is loose, you can check the condition of the upper region to see if it is cracked or soft. The top edge of it can also be checked from inside the car. Original plywood may have de-laminated and if this has happened, it will be easy to flex the wood with your fingers. 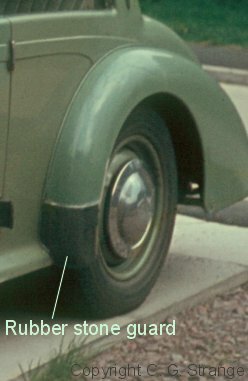 On most AC Bucklands, the bonnet seal is thinner and a bit of the plywood is visible. Another essential plywood area to check is at the rear: The boot side panels. These help to hold the rear of the frame together and also bolt to the chassis. They are visible from inside the boot, but the vulnerable areas are at their lowers edges which are covered by the steel inner rear wings. Not surprisingly, the inner wings are among the first parts to rot away too. If the car has been restored at some stage in its life, then it is possible that the wooden frame has been extensively modified. This is because the wood screws are mostly concealed by the bodyshell, and many restorations are achieved by rebuilding from the inside without retaining originality. This might not matter if you are not bothered about keeping things very original, but it is important to see that changes to the car's structure from the original design, should have been done in a competent manner. Another tell-tale sign of wood rot is cracking of the alloy bodyshell. This often happens along the 2 thin strips running across the rear end. The weld at each end cracks, although the paint might conceal this. It results from body flexing after the wood frame rots (and wood glue joints fail). A look inside the spare wheel compartment will also show the two steel panels for its sides and floor. The mounting bolt on the side of each wing may corrode its way through the alloy unless it is insulated from it. The front inner wings are of steel, although a fairly heavy gauge, but may still rust through. Some fittings may be missing altogether. 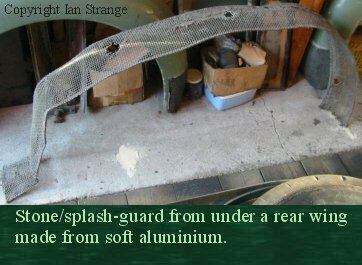 Under each wing, you should find a soft aluminium mesh guard. These tend to corrode where they touch the steel brackets. Many cars are missing their rubber stone guards for the rear wings. 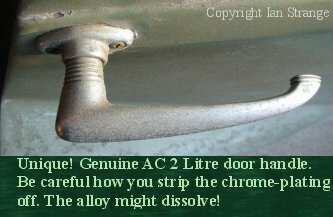 The original external door handles are (I believe) unique to the AC, but some cars have had them replaced with other types. 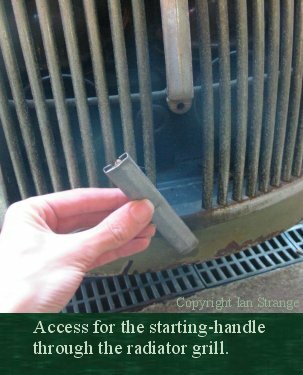 Check the radiator grill and make sure that the pivoted section for starting handle access, is not missing. The only external rust that you might come across, is on the bumpers. ACs came with a good set of tools, and it is rare to find a car still fitted with the full, and correct, set. A grease-gun is clipped inside the engine bay (left-hand side). To the sides of the boot are clipped the jack, hand tyre-pump, and starting handle. The toolkit in the boot lid contains the following: 4 chrome-plated Garrington-Merlin spanners marked in old Whitworth sizes (from 1/8" to 1/2" with 7/16" duplicated); sparkplug box spanner and bar; pair of pliers; bonnet key; hubcab removal lever; wooden handled screwdriver with feeler gauge; wheel brace. 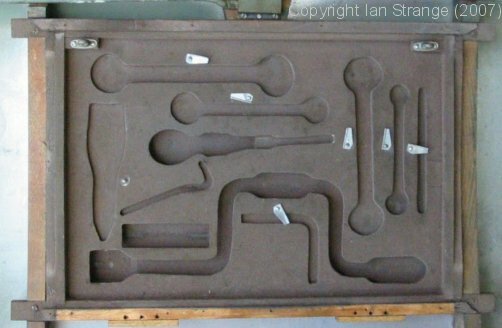 Some toolkits included a 3/16"W box spanner (not fitted to the toolkit illustrated below). AC Bucklands differ from the other 2 Litre variations, for their fitted equipment and accessories. One of the biggest problems to hit AC engines in their old age, has been cylinder-head gasket leaks. Alloy block corrosion, cylinder-liner gasket design, liners not sitting level with each other, or repairs to the block, may contribute to this. Thankfully, improved components are available. Early warning of an impending head-gasket failure, is oil trailing out of the breather on the rocker-cover. A milky colour to the lubricating oil will suggest that this problem is more advanced. The original rear main oil seals are of an out-dated design, but many engines have been converted to take modern seals. The water-pump is another potential problem area, as this may leak. A rusted chassis just below this pump is a bad sign! Some owners have modified their water pumps to reduce leakage. Newly over-hauled pumps may need further running in before leakage stops. Most leakage occurs at idling speed. For performance, the AC should be able to cruise very quietly at 60mph. The engine is quite lively through the mid rev range, but runs out of breath at higher revs, unless it has been fitted with larger carburettors (1 1/8" on most cars). Oil pressure may be as low as 10 to 15psi at idle, when warm, rising to 80psi at higher revs. There is a little bit of mechanical noise from the engine at about 45 to 50mph in 4th gear, unless it is a later engine fitted with a crankshaft damper on the front of the engine. Apart from that, there should be no rattles or valve-gear noise. Fuel consumption should be in the 20 to 27mpg range. Many engines have had higher compression pistons fitted, so both power and economy may be better than these quoted figures. The Moss gearbox has rather ineffective synchromesh, by modern standards, so this needs to be taken into account when deciding if the gearbox is worn out. 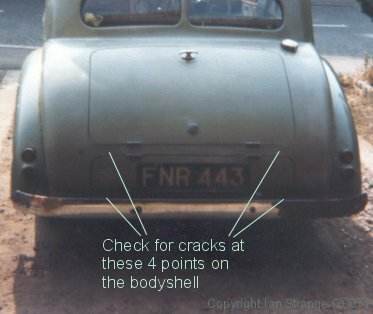 The chassis is made from a heavy gauge of steel, but the rear end might be rusted through if the car is in very poor condition. The rear underpan catches spray and mud and so is vulnerable. The rear cross-member might even have broken up where the springs are attached, so this is the most important structural area to inspect. King-pins require greasing every 500 miles, and wear out fast otherwise. So check these for play. A tiny amount of play can be tolerated provided that the front wheel toe-in is adjusted to compensate. If the toe-in is not right, the car will be deflected off course each time a front wheel strikes a bump in the road. If you just want to buy an AC in good road going condition, beware of poor rebuilds, or cars that have been superficially "restored", with shiny paint and a re-trim. 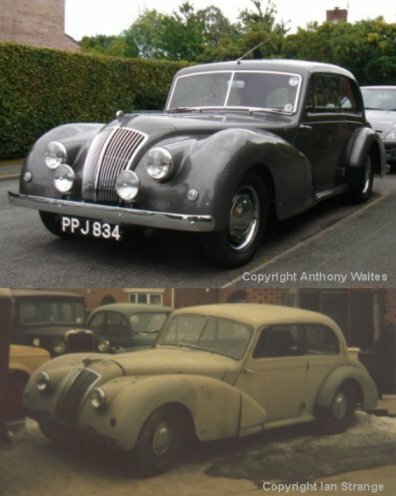 If you fancy doing a restoration, keep in mind that it will be harder than you expect, so it may be best to take on a car that looks in reasonable shape to start with. Only tackle an AC that is in very poor condition, if you have the experience/skill, etc. or if you relish a big challenge.